We are excited to announce new additions to the VR for Impact initiative! As part of Vive's ongoing commitment to foster and champion the use of virtual reality to drive positive impact, we're humbled to announce our support for three new projects we strongly believe in: OrthoVR, the Life Project, and The Blank Canvas. They join our growing selection of projects that we believe embody and represent the spirit and opportunity presented by the Sustainable Development Goals. They join Tree, The Extraordinary Honey Bee, and SpaceVR as projects we're dedicated to providing on-going support towards realizing. Exciting announcements surrounding VR for Impact are on the horizon. We will be announcing additional grant recipients throughout 2018. New applications, and updates to previous applications, are currently being accepted. OrthoVR aims to increase the availability of well-fitting prosthetics in low-income countries by using 3D and VR design tools to increase the capacity of clinical staff in developing regions without reducing quality. VR enables current prosthetists and orthotists to leverage their lifetime accumulation of embodied and hands-on skills within a spatialized digital environment. OrthoVR is a joint project between Nia Technologies, a non-profit developing digital tools for orthopaedic clinics in the developing world (www.niatech.org) and the Critical Making Lab at the University of Toronto (www.criticalmaking.com/enaction). LIFE (Life-saving Instruction For Emergencies) is a new mobile and VR platform under development by the University of Oxford that is designed to provide healthcare workers with universal access to high quality medical education. Through the use of telepresence, personalized simulation training, and advanced learning analytics, the LIFE platform offers the potential to dramatically promote access to life-saving knowledge in developing nations. The Blank Canvas: Hacking Nature is an episodic exploration of the frontiers of bioengineering as taught by the leading researchers within the field. Using advanced scientific visualization techniques, The Blank Canvas will demystify the cellular and molecular mechanisms that are being exploited to drive substantial leaps such as gene therapy. Examples of early episode topics will optogenetics as well as CRISPR/Cas9 genomic editing. This project is presented by SNOWCRASH/FLAGCX & LOBO in partnership with MIT Media Lab, Fluid Interfaces, and HTC Vive. More information can be found at https://www.blankcanvas.bio. Tree, co-directed by Winslow Porter and Milica Zec of New Reality Company, is a critically acclaimed virtual reality experience enhanced via haptic feedback to immerse viewers in the tragic fate that befalls a rainforest tree. The experience brings to light the harrowing realities of deforestation, one of the largest contributors to global warming. Tree was the recipient of an Unreal DevGrant and HTC Vive’s “VR For Impact” grant and created in partnership with the Rainforest Alliance (https://www.rainforest-alliance.org/). It premiered at Sundance Film Festival 2017 before heading to Tribeca, TED, Cannes and AFI Fest. For more information on Tree, please visit http://www.treeofficial.com/. The Extraordinary Honey Bee is a joint project with Häagen-Dazs® ice cream which explores the alarming rate at which bee populations are falling. In The Extraordinary Honey Bee, users will shrink down to the size of a bee for a guided VR experience where they learn of the risks bee colonies face and solutions currently being implemented to offset their decline. For more information on The Extraordinary Honey Bee, watch the announcement trailer. SpaceVR is the world’s first virtual reality platform allowing users to experience space first hand through the immersion of VR. 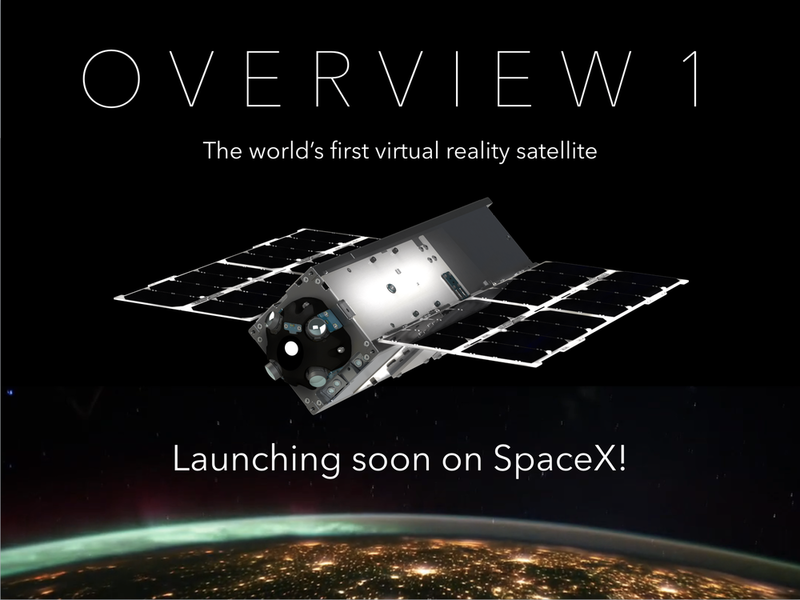 Founded in 2015, the team has built the first VR satellite, the Overview 1, which is slated for launch in 2018 aboard SpaceX CRS-14. Once in orbit, SpaceVR will downlink high-quality 360-degree stereoscopic VR video. For more information on SpaceVR, please visit www.spacevr.co and check out their official intro video.